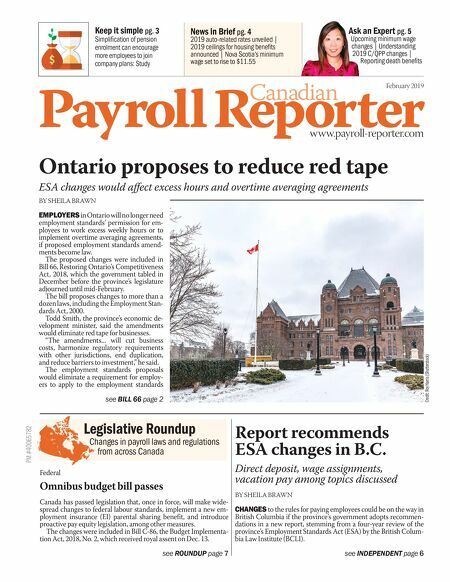 Payroll Reporter Can R Can R adian adian a www.payroll-reporter.com February 2019 Ontario proposes to reduce red tape ESA changes would aff ect excess hours and overtime averaging agreements BY SHEILA BRAWN EMPLOYERS in Ontario will no longer need employment standards' permission for em- ployees to work excess weekly hours or to implement overtime averaging agreements, if proposed employment standards amend- ments become law. The proposed changes were included in Bill 66, Restoring Ontario's Competitiveness Act, 2018, which the government tabled in December before the province's legislature adjourned until mid-February. The bill proposes changes to more than a dozen laws, including the Employment Stan- dards Act, 2000. Todd Smith, the province's economic de- velopment minister, said the amendments would eliminate red tape for businesses. "The amendments... will cut business costs, harmonize regulatory requirements with other jurisdictions, end duplication, and reduce barriers to investment," he said. The employment standards proposals would eliminate a requirement for employ- ers to apply to the employment standards see ROUNDUP page 7 PM #40065782 Legislative Roundup Changes in payroll laws and regulations from across Canada see INDEPENDENT page 6 Credit: Roy Harris (Shutterstock) see BILL 66 page 2 News in Brief pg. 4 2019 auto-related rates unveiled | 2019 ceilings for housing benefi ts announced | Nova Scotia's minimum wage set to rise to $11.55 Keep it simple pg. 3 Simplifi cation of pension enrolment can encourage more employees to join company plans: Study Ask an Expert pg. 5 Upcoming minimum wage changes | Understanding 2019 C/QPP changes | Reporting death benefi ts Report recommends ESA changes in B.C. Direct deposit, wage assignments, vacation pay among topics discussed BY SHEILA BRAWN CHANGES to the rules for paying employees could be on the way in British Columbia if the province's government adopts recommen- dations in a new report, stemming from a four-year review of the province's Employment Standards Act (ESA) by the British Colum- bia Law Institute (BCLI). Federal Omnibus budget bill passes Canada has passed legislation that, once in force, will make wide- spread changes to federal labour standards, implement a new em- ployment insurance (EI) parental sharing benefit, and introduce proactive pay equity legislation, among other measures. The changes were included in Bill C-86, the Budget Implementa- tion Act, 2018, No. 2, which received royal assent on Dec. 13.